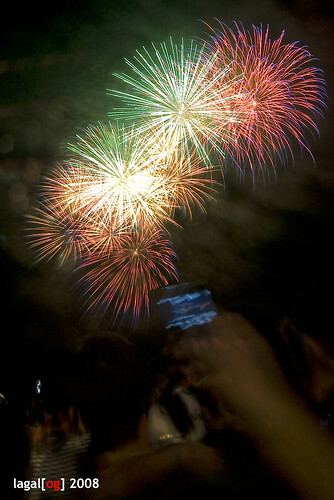 The Philippines participated as guest in the Pyro Olympics. I wasn't around last year to witness the event but friends were saying the program last year was longer and more spectacular. Nevertheless, the host country put on a wonderful performance capped by a unique ending (which I didn't capture because I ran out of card memory). We staked our position at the breakwater near Pier One, very near the barge's location, early on but moved back because of the thick crowd. Here's an interesting take I captured during Team Philippines' performance where a cellphone-wielding member of the crowd seem to be holding a sparkler, producing a display that dazzled the crowds as much as the other participating countries did. serendipity lang talaga arlene because it's pretty hard to compose well with the moving crowd. talagang taking my chance lang ito.